Roundwood Community Council is undertaking a survey to identify needs in the community that RDCC can address or seek to have addressed for the community. The link below will take you to the online survey and we would appreciate it if you would take some time to fill it in – your response will be anonymous. On Friday 28th April at Kavanagh’s pub, Roundwood the annual East Coast Coffee morning will be held. The proceeds of which go to the five Cancer Support Centres in the Wicklow area and the Wicklow Hospice. It starts at 10a.m and finishes around mid-day. Please come along with some friends, make a donation, enjoy tea/coffee and refreshments and be in with a chance to win some wonderful prizes. Entertainment will be provided on the day also. Roundwood and the surrounding areas have always been extremely generous at this event so come along and support this great cause. A reminder that the Active Retirement Lunch club will take place on Friday 28th April in Byrne & Woods Please note that membership fees are now due. Now with the longer evenings the Wednesday evenings walks can take to the countryside! 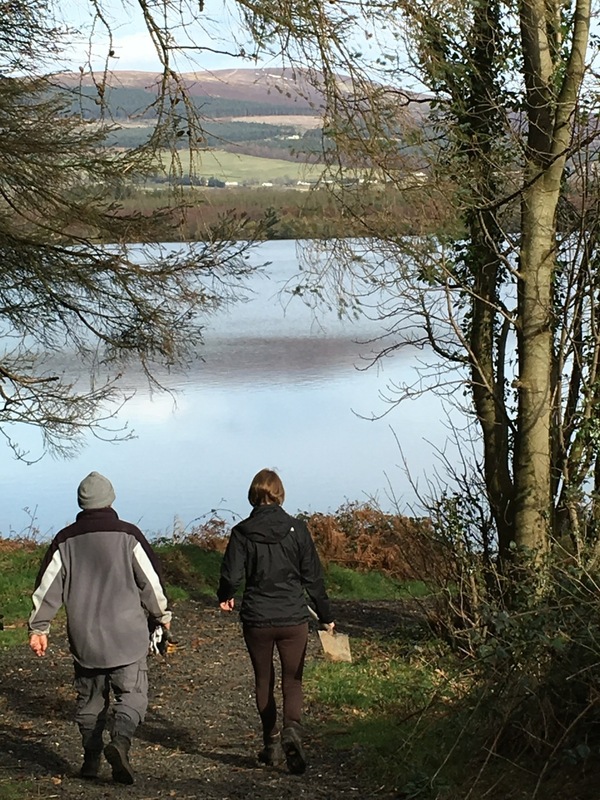 The walks will leave from the Coach House car park on Wednesdays at 7pm to take in some of the great walks around the Vartry Reservoirs. Do come along & bring a friend. There will be a Coffee Morning & Cake Sale on Saturday 13th May at 10am till 12.30pm in Roundwood Parish Hall in aid of The Martin Family Trust. There will be a raffle on the day. Donations of baking and spot prizes will be very gratefully received. Everyone is welcome so come along and enjoy a chat and a cuppa for a very worthy cause. For further information please contact Val Halligan 086 107 0380 and Sue Gaskin 087 675 7147. There will be a Country music break to Westport from the 22nd to the 27th October with day trips on some of the days. It will be five night, six day tour with dinner, bus from Roundwood and back, dinner, bed and breakfast in the 3* The Westport Woods Hotel and music every night with acts such as T.R. Dallas, & Mike Denver and many more. Day trips to Achill Island, Wild Atlantic Way to a pint in Matt Molloys bar. The price will be €399 per person sharing with a €90 single room supplement. A €200 deposit is required before 15th May. Please contact Susan on 087 6273032 for more details. All moniey to be paid before 1st August, 2017. Progressive 45 card game on Sunday 14th May at 7.30pm sharp in the Roundwood Parish Hall, Excellent prize money with refreshments at the break. In aid of The Under 17 An Tochar GAA Team. A bus will leave Roundwood for a pilgrimage to Our Ladys Island on Sunday 20th August. Cost is €60 per person which includes scones & tea and dinner in the Riverside Park Hotel. Names and money before 1st June, 2017 to Susan at 087 6273032. Coffee Morning & Cake Sale – Fundraiser for the Martin Family Trust. Saturday May 13th – 10am to 12.30pm in Roundwood Parish Hall & Centre. – Please come along and enjoy some time with family and friends and by doing so support these two little boys and their family. All donations will be gratefully received.and another date for your diary – Friday 28th April, there will be a fabulous table quiz and rock n roll bingo in the Grand Hotel Wicklow. It’ll be lots of fun, a fantastic raffle with some amazing prizes: tickets to the Late Late, a walk on part in Fair City and much more. Tickets are a snip at only ten Euro. The SHED is open at Pat Carr’s place in Knockraheen every Tuesday between 10 and 12. The improved weather conditions means that our virgin gardening will soon get underway. Double and single beds will be available and it has been asked whether these beds could also be provided indoors! Bunk beds have also been mentioned. Feel free to come along and get involved in the healthy, therapeutic growing venture. You can be assured of a warm welcome. The members are very grateful for all the support and good will towards the SHED. This was shown in a special way at the recent Open Day organized by the RDCC. For further information call 086 8650588.. There was no jackpot winner in last weeks lotto draw. The numbers drawn were. 3, 21, 27 & 30. There were three match three winners, Joe Price, Anita Byrne & Jackie Wolohan. Next week’s jackpot will be €14,200. Next whist will be on Wednesday 26th April in the Parish Centre. Roundwood Set Dancing continues every Thursday night from 9pm til 11pm in Kavanagh’s Lounge, Roundwood. Music this month is CD’s and we will have the O’Kane Family back playing for us again in March and then live music for the remainder of the year. Admission remains at €5. Beginners are always welcome along with anyone looking for a bit of exercise and a fun night out. This entry was posted in News & Events on April 24, 2017 by roundwoodiewicklow. On Saturday Morning May 13th, friends of The Martin Family are organizing a Social Coffee Morning & Cake Sale from 10a.m – 12.30pm in aid of Cathal and Ciaran Martin (Aoife Brady’s nephews). Cathal and Ciaran are two little boys aged 2 and 1 years old who have recently been diagnosed with late-infantile Metachromatic Leukodystrophy (MLD) – a rare, genetic illness with no known cure. Ciaran has started a six-month treatment programme which began on March 25th. This treatment begins with an intense Gene Therapy programme, and a course of chemotherapy which will require 24 hour family support and care. While Ciaran is receiving treatment one parent will travel to Milan with Ciaran while the other will stay at home to look after Cathals complex medical needs. Please come along and enjoy some time at the Parish hall with friends and by doing so support these two little boys and their family. There will be a Cake Sale and Raffle on the day. Come along and support this worthy cause, all support is welcome. The Great Roundwood & Moneystown Spring Clean is scheduled for the week of the 27th of April as part of the nationwide Spring Clean campaign. Lots of folk are keeping the rubbish at bay throughout the year via the Adopt a Spot. Now is a good time to have a litter pick as the roadside vegetation is low and rubbish embedded in the ditches for years is very visible. So if you can put in an hour in your area please lend a hand. There are a limited number of litter pickers but plenty of refuse sacks/recycling bags/gloves available for volunteers. If you are new to the area it’s a great way to meet the neighbours! You can do your clean up at any time if this particular week does not suit. For litter pickers, bags or to make arrangements to collect rubbish bags if the need arises please call 087 2551579. A bus will leave Roundwood for a pilgrimage to Our Ladys Island on Sunday 20th August. Cost is €60 per person which includes scones & tea and dinner in the Riverside Park Hotel. Names and money before 1stJune, 2017 to Susan at 087 6273032. Coffee Morning & Cake Sale – Fundraiser for the Martin Family Trust. And another date for your diary – Friday 28th April, there will be a fabulous table quiz and rock n roll bingo in the Grand Hotel Wicklow. It’ll be lots of fun, a fantastic raffle with some amazing prizes: tickets to the Late Late, a walk on part in Fair City and much more. Tickets are a snip at only ten Euro. The results of the whist are as follows:- Top Score: Richie Cullen; Top Gent: Margaret Kennedy; Second Gent: Tom McHugh; Top Lady: Monica Brady; Second Lady: May Kenna; First Half: Marie Magee; Second Half: Ann Wolohan; Longest Sitting: Tiney Shortt & Lowest Score: Kitty Kennedy & Maura McHugh (shared). Raffle prizes were won by: Mary Pierce, Kitty Kennedy, Tiney Shortt, Richie Cullen & Lucy Molloy. Next whist will be on Wednesday 26th April in the Parish Centre. This entry was posted in News & Events on April 18, 2017 by roundwoodiewicklow. Catherine McGillycuddy and Monica Brady took 1st place for North/South on Monday 4th April, 2nd Catherine Halligan and Brid Clancy, 3rd Nancy O Brien and Phil Power and 4th Kay Plunkett and Pamela Byrne. Victors for East/West were Rory Egan and Declan O Brien, 2nd Ger Lenihan and Paddy O Brien, 3rd Maura Gaskin and Clare Sally and 4th Molly Byrne and Rachel Judd. There will be no Bridge on Monday 17th April. Happy Easter to all. Playing their cards right on Friday 7th April for North/South were June Digby and Monica Brady, 2nd Seamus Kennedy and Triona Woodroofe, 3rd Kay Plunkett and Alice Chadwick and 4th Gertrie Fee and Jane Cronin. Taking 1st place for East/West were Teresa Leahy and Marian Davis, 2nd Noeleen Redmond and Margaret Bolger, 3rd Bridie Nolan and Maura Gaskin and 4th was the Birthday Boy Ger Lenihan with his regular partner Paddy O Brien. No Bridge on Good Friday. Happy Easter. The Wicklow Mountains National Park are organising an Easter Quest for families. Call into the National Park Information Office at the Upper Lake between 10 a.m. to 4:30 p.m. on Good Friday 14th April to Easter Monday 17th April 2017 to collect a questionnaire. All the questions are egg related, and the answers can be found around the lawns at the Upper Lake with the help of a small map. The quest takes about 30 minutes. There is a small prize for each child that participates, but please note, it won’t be chocolate eggs! Please bring a pen to write with. No booking is required and it is free of charge but please note you may to pay for parking in the Glendalough area. For more information, please phone 0404 45656 or 0404 45425. Next whist will be on tonight, Wednesday 12th April in the Parish Centre. This entry was posted in News & Events on April 10, 2017 by roundwoodiewicklow.